Wash showing the view from Fort George in Bombay towards Mazagaon by William Miller (1795-1836) c.1828. 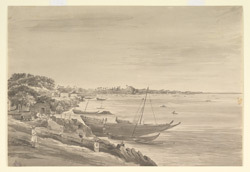 Inscribed on reverse: 'View from the Esplenade of Fort George Bombay towards Mazagon'. The area of Bombay was orignally made up of seven islands, including Mazagon. From the mid-16th century, the Portuguese had a manor house located here that was closely associated with the De Souza family. After the area of Bombay was ceded to English control as part of the dowry brought to Charles II by the Portuguese princess Catherine of Braganza in 1661, Mazagon became an affluent residential district.